William Hull served with distinction during the Revolutionary War. He remained active in civic affairs, and in 1805, President Thomas Jefferson appointed him Governor of the Michigan Territory. In 1812, President Madison prepared for a war against England for a variety of reasons, including the British practice of boarding American ships on the high seas, other British restrictions on US shipping and the British practice of encouraging Indians to attack US settlers and troops in the Midwest. In the spring of that year, the President appointed Hall to command troops in Michigan. This was a job that he did not seek, perhaps because of this advanced age—60. Hall was appointed a Brigadier General and, in May, 1812, went to Dayton Ohio to take command of Army regulars and Ohio Volunteers. On June 1, 1812 they began their march to Detroit to staff Fort Wayne. Since there were few roads in Ohio at this time, Hull and his troops had to cut their way through woods, fill in marshes and make their own facilities to ford rivers. On June 18, President Madison signed the Congressional Act declaring war against England. Hull and his troops arrived in present-day Toledo without knowing that the war had begun. Hull sent a vessel up the Detroit River to Fort Wayne. The British troops in Canada knew of the declaration of war and captured the boat Hull sent to Detroit. While at Toledo, a messenger arrived from Washington telling him of the war. Hull might have attacked the British at Fort Malden—present-day Amherstburg—but he decided to move his troops to Fort Wayne in Detroit. Shortly after arrival—on July 12, 1812—he invaded Canada, but then withdrew to Detroit on August 3, 1812. General Hull believed that his forces and Detroit were in great danger. He knew that the British had captured the United States forts at present-day Chicago and Mackinaw City. He believed that strong British and Canadian forces were arrayed against him to the east and presumed that the British had armed Michigan Indians so that they would attack upon command. Fort Wayne could not be supplied by water since the British controlled the Detroit River. Realizing the difficult position of the American military in Detroit, Ohio volunteers arranged a supply train that included 300 head of cattle and numerous packhorses carrying a total of 1,400 pounds of flour. They were to march across Ohio toward Detroit. General Hull assumed that Indians would inform their British allies when the supply train approached Detroit. Thus, General Hull dispatched troops to march south to secure the precious supplies and make sure they got to Detroit. However, the first troops sent for that purpose were defeated in Brownstown on August 4, 1812 by British and Indians led by British Captain Adam Muir and Chief Tecumseh. Hull then dispatched Lieutenant Colonel James Miller to march south from Detroit with 280 regulars and 330 Ohio and Michigan volunteers. At this time, there were no roads linking Detroit to Ohio. Troops followed Indian trails or created their own paths as they advanced. They left Detroit on the evening of August 8, 1812. The next day these American forces met the 205 British and Canadian troops and Indian warriors commanded by Adam Muir who won the battle at Brownstown one week earlier. This battle went very poorly for the British. After the Americans fired, British regulars sensed that there was movement in the woods that surrounded them. Thinking, these were Americans crawling along the ground, they fired upon the movement in the trees only to learn that these were their Indian allies who took a very different approach to warfare than did Europeans. The Indians fired on their British colleagues. This matter was rectified, but the August 9 troubles of the British did not end there. Seeing an opportunity, British commander Muir sounded the call for his light infantry to advance against the Americans. However, many of the British troops misinterpreted the call and thought that Adam Muir was calling for retreat. British troops pulled back allowing the Americans to advance. Understanding that this was not a good day for the Majesty’s forces, Muir ordered his troops to cross the Detroit River and return to the safety of Fort Malden in Amherstburg. Muir’s report stated that three British troops, one Canadian and two Indians were killed in this battle. Lieutenant Colonel Miller reported the loss of 18 troops and was, apparently, quite frightened. He was wounded in the fighting. He believed that the British were about to ambush his forces when the British were actually across the river. After General Hull in Detroit learned of the Battle of Maguagon, he ordered Miller to resume his march to meet the supply train. Miller refused, claiming that his forces were decimated and, I believe, that he was personally sick. General Hull once again commanded that Miller advance, but for two days, Miller maintained his defensive position. Realizing that Miller would not advance, Hull ordered him to return to Detroit. But for larger issues, Lieutenant Miller might have been court-martialed for refusing an order to fight. However, General Hull in Detroit thought that he was surrounded by British, Canadian and Indian forces on all sides and that Americans would not be able to provide supplies by water or land. British General Brock conveyed to Hull that not only would British forces attack Detroit, but that he had no control over the mayhem that Indians might cause. At this time, Indians—but not Europeans—usually scalped those they captured, injured or killed. By this time, General Hull knew that the American forces lodged at Fort Dearborn—present-day Chicago—were surrounded by Indian allies of the British He ordered that Americans retreat to safety at Fort Wayne in Indiana. The Indians agreed to permit the Americans to leave Fort Dearborn and 148 started their march to Fort Wayne on August 15, 1812. However, the Pottawatomie attacked the Americans just after they left Fort Dearborn, killing more than 50 and selling the rest to the British. Feeling that he was isolated from supplies and about to be attacked by Indians and the British, Hull decided to surrender the city of Detroit without a fight on August 16, 1812, just one week after what American textbooks call the successful Battle of Mongaugon. Less than two years later, General Hull was court martialed for surrendering Detroit without a battled and found guilty of cowardice. He was sentenced to be shot by a firing squad. President Madison commuted that execution. Hull retired to his home in Newton, Connecticut and lived for another dozen years. He published two books in an attempt to clear his name and reputation. 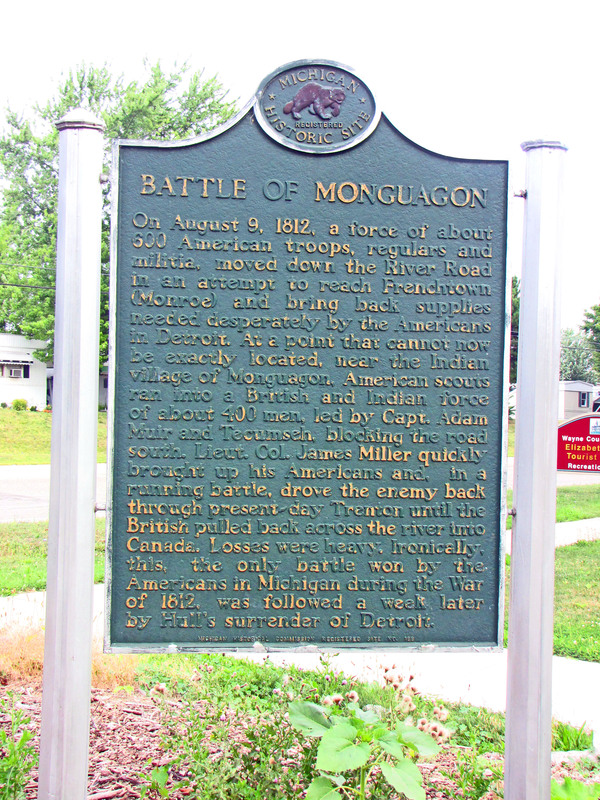 This battle bears the name Maguagon because it was fought near the Wyandotte Indian village of Maguaga. It is sometimes cited as the Battle of Maguaga or the Battle of the Oakwoods. A long description of the Battle of Mongaugon can be found in Clarence Burton’s book, The City of Detroit: 1701-1922 (Detroit: S. J. Clarke, 1922; Four volumes). State of Michigan Historical Marker: Put in place August 9, 1962 and not been refreshed since then.